When ad agency art director Ro Mars (Stephanie Szostak) notices Kevin Sinks (Karl Geary) on the street and impulsively follows him to a bar, it sets off a chain reaction that may undo them both. 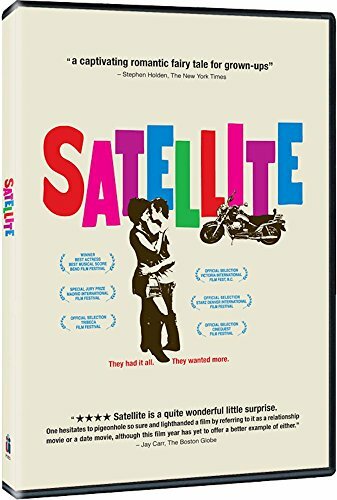 An acclaimed festival favorite from director Jeff Winner, Satellite is, at its core, a romantic fable about a pair of millenials who give up everything they have in order to find something better. During a three-day marathon of passion, they make a pact to push each other to do the things they've avoided or are afraid of, and never lie to one another. Fueled by new love and a sense of adventure, Ro and Kevin impusively quit their jobs, sell all their possessions, and begin stealing to make ends meet. However, their new life of free-spirited adventure is nearly derailed by Ro's self-destructive streak of jealously and a dark secret she steadfastly refuses to reveal. Equal parts American Indie and French New Wave, carried along by combustible chemistry between the stars, dreamy cinematography and a superb soundtrack featuring original songs by Calla, Satellite "touches a chord" and "captures the wistful underside of the rampant materialism embraced by the young professional class". About Stephanie Szostak, Stephen Holden of The New York Times writes, "[she] combines Audrey Tautou's gamine beauty with the seething inner turbulence of Jeanne Moreau's Catherine in Jules and Jim." The film also co-stars Pell James (Annie), Christina Kirk (Susanne Sinks), and Larry Fessenden (Jim Mullins).